*Québec does not contribute to the Discharge Abstract Database. http://publications.gc.ca/collections/collection_2014/aspc-phac/HP7-1-2013-eng.pdf – accessed June 20, 2017. For more information on congenital anomalies and neural tube defects see Section 5: Congenital Anomalies; Genetics and Paediatric Health Module. 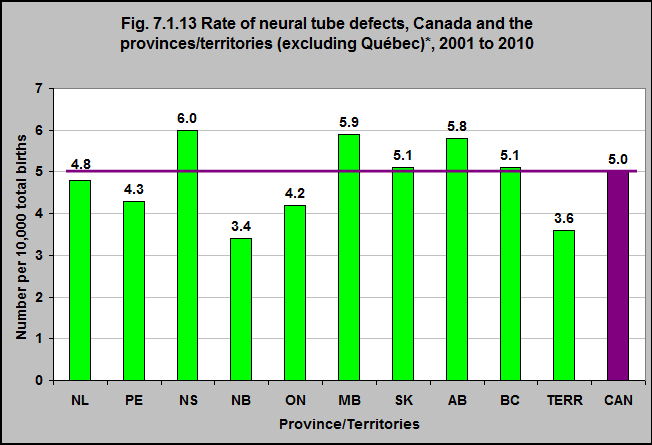 From 2001 to 2010, the rate of neural tube defects varied by province and the territories. The rate was 6.0 in Nova Scotia and 5.9 in Manitoba. It was 3.4 in New Brunswick and 3.6 in all three Territories combined.